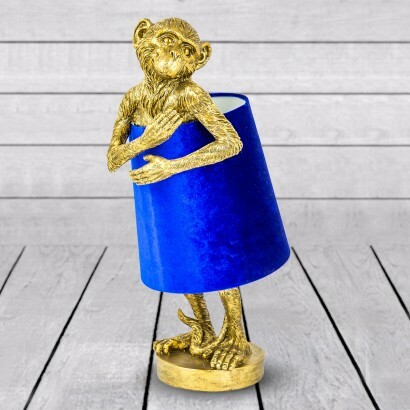 Standing with a coy expression hiding inside a luxurious blue lampshade, this cute little monkey makes a stylish table lamp! 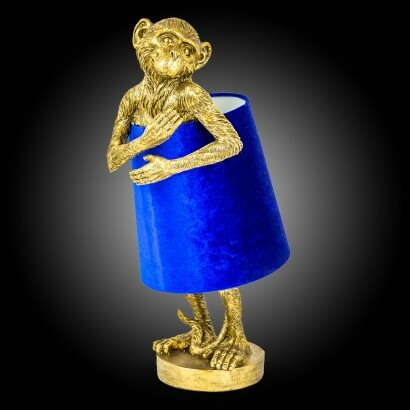 Standing at 55.5cm tall, this charming designer lamp adds comic character to your interiors as the bashful monkey peers from behind the lampshade to form the body of the lamp. Delightfully kitsch in vibrant yellow gold with a bright royal blue velvet shade, this stylish table lamp makes a fantastic statement piece. Please note:To secure the shade, pass the body of the monkey through the top of the shade, base first. the metal ring forming the top of the shade fits snugly in the armpits of the monkey, with magnets moulded in to the body providing extra security.